Hard to believe it's already been two years! Happy 2nd Birthday to Dunn DIY! We launched our site June 3rd, 2014. Hard to believe it's been two years already! Today we have over 100 different posts and almost 50 videos. And still it feels like we're just getting started! There's always a long list of future projects we have running and crazy plans we're deriving. But we'll let all that wait for the future. In the meantime we want to thank all of you for joining us on the journey. For following along, interacting with us, inspiring us to continue with what we're doing. It wouldn't be half as much fun if you weren't here. So here's to you and us, and to many more years of DIY! 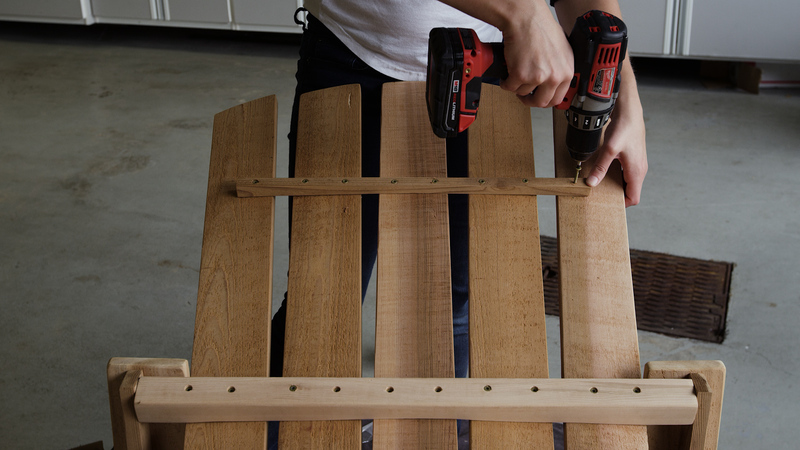 When using cedar in projects, you can choose between clear grain and tight knot cedar. The clear grain is a little more expensive, but has a really nice look and is easy to work with because you don't have to work around knots. The chair we made uses clear grain cedar. 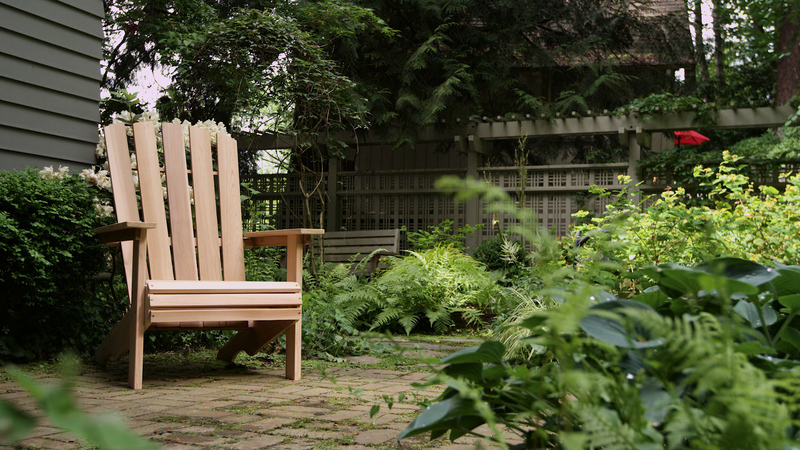 Adirondack chairs are often made or bought in pairs, and as it turns out, making two at a time is a more economical use of your lumber. One chair's worth of materials costs around $100, whereas buying materials for two chairs cuts the cost per chair by about 20%. If you want to build two, here is an updated list of the lumber needed. The initial cuts are all of the straight edge cuts that will set you up to make the more complex curved cuts. Following the cutting diagram, use a chop saw or a circular saw to make the cuts. Set aside the 1" x 2" x 21 1/4" pieces, the 1" x 2" x 23" pieces, and the 5/4" x 4" pieces. These pieces don't need to be cut any more. Next, it's time to make the more complex cuts. Get out a sawhorse and a couple of clamps and don't forget your safety wear! As you make these cuts be aware of which side of the lumber you're working with. Most of the clear cedar comes with one smooth side and one rough side. You'll want the smooth side of the lumber facing up on the seat and the armrests, and facing in on the back slats. 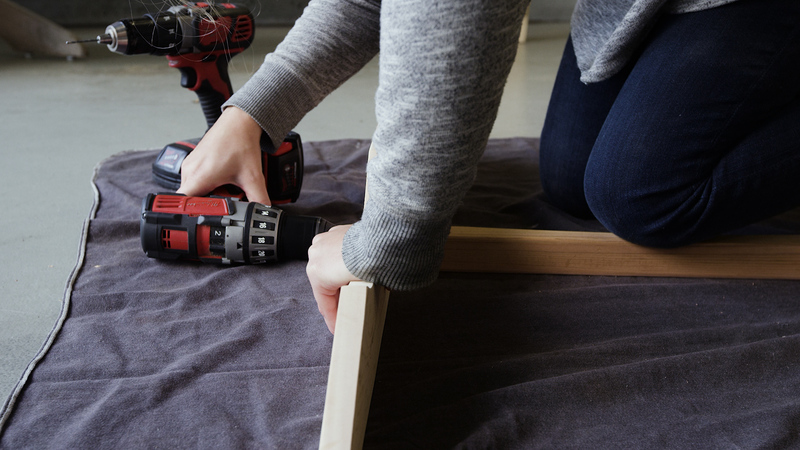 With a measuring tape and a straight edge, mark the angled cut for the two arm rests (1" x 6" x 25"). Measure at 3 1/2" on one end and at 4" on the other. Draw a line in between (shown in the diagram below). 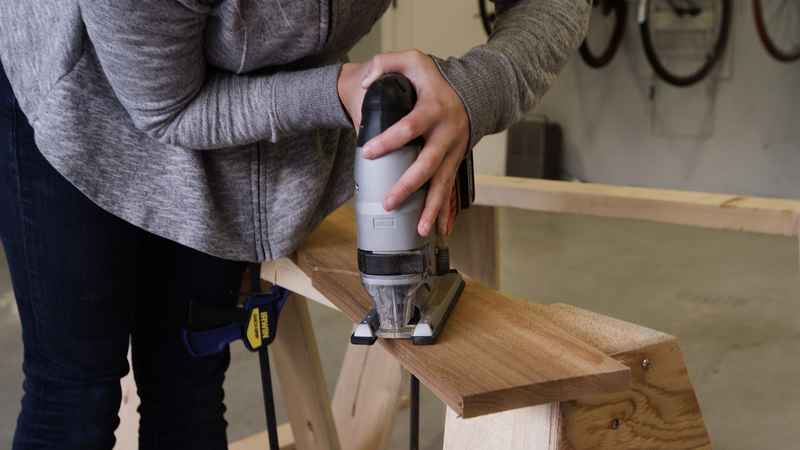 Clamp the board to your sawhorse and cut with a circular saw. Make sure to cut these arm rests with a left and a right side. The three back support pieces will be cut with a jigsaw. 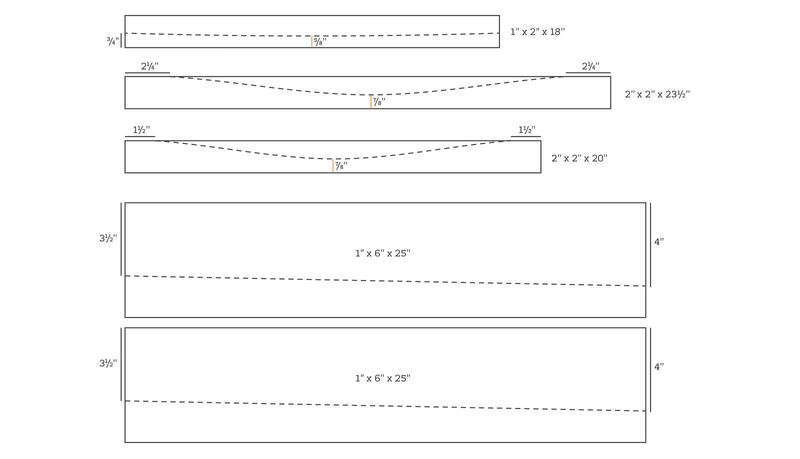 Following the diagram below, mark the 2" x 2" x 20" piece, the 2" x 2" x 23 1/2" piece, and the 1" x 2" x 18" piece. Clamp the board to the sawhorse and cut along the line from either end, meeting in the middle. 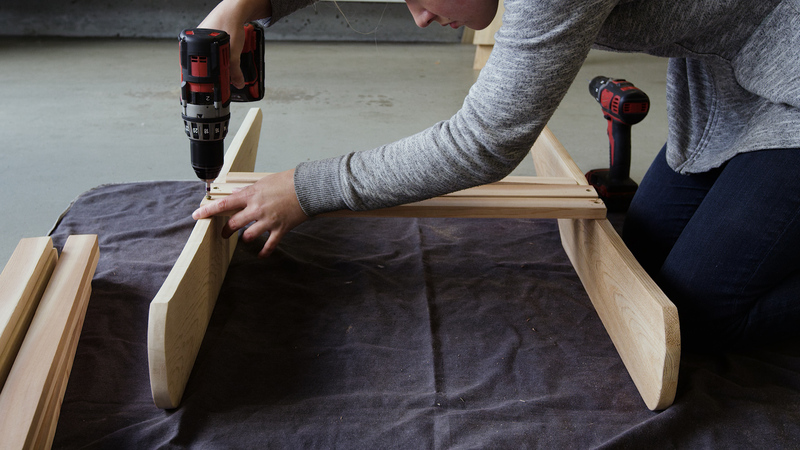 Because these pieces are small, to keep it safe let only a little bit overhang the side of the sawhorse at a time and readjust the board and clamps often as you cut. The goal with these cuts is to create an arc shape, but even cutting in a "v" towards the center will be fine as the boards drilled on top will soften the angles. Next, cut the rounded top edges of the back slats. 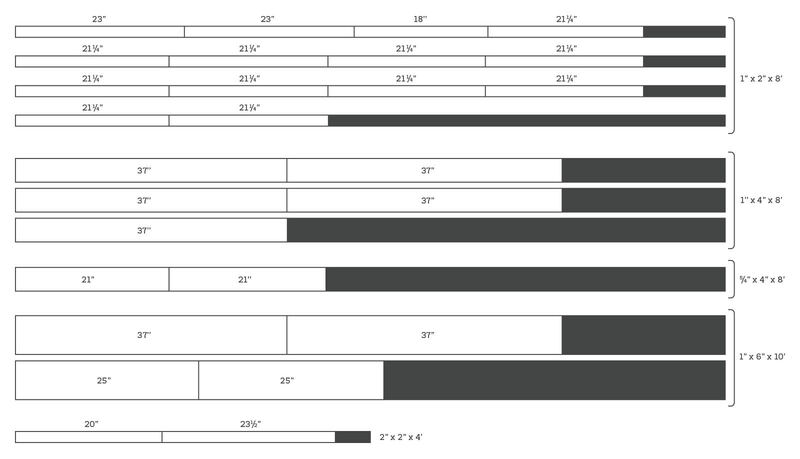 Print and cut out this pattern to trace onto your 1" x 4" x 37" boards. Start with the middle board positioning the top of the curve at the 36 1/2" mark. Clamp down and cut with a jigsaw. Use this board as a reference point for cutting the other boards so the edges of the curves line up. The last cut is the biggest and the most complex. This is the classic diagonal leg of the adirondack chair. Print this pattern, tape together, and cut out. Position in the corner of the 1" x 6" x 37" piece. Line up the bottom of the pattern with the edge of the board and the front of the curve with the board's end. Trace onto the board with a pencil and cut it out with a jigsaw. To get really a really clean look, we switched to a circular saw for the straight edge on the bottom of the leg, and on the back half of the top. As with the previous cuts, to stay safe, keep the saw close to the edge of the saw horse and adjust as you go. Be careful of turning the blade too sharply and causing it to bind. 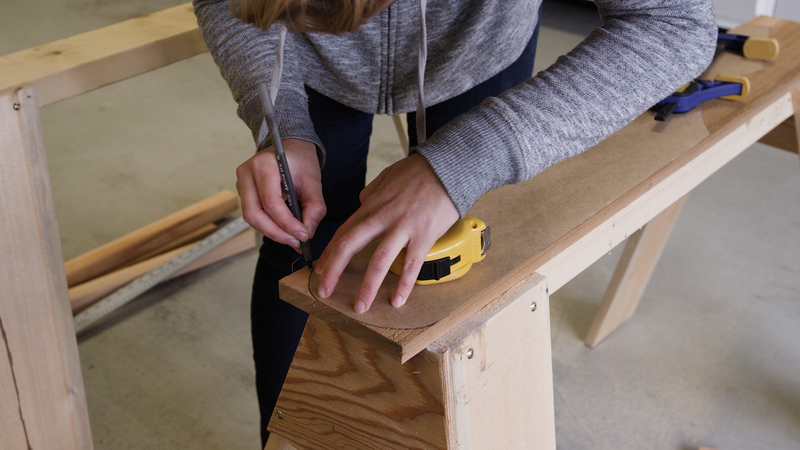 Before you spend time sanding, do a quick dry fit with the bottom back support (2" x 2" x 20"), the diagonal legs, and the seat slats (1" x 2" x 21 1/4"). The back support will fit in between the legs, and the slats should span across the legs without hanging over the side. Adjust any cuts if necessary. When all your pieces are cut, it's time to sand.This is really the mindless, time-consuming part of the project. We used an electric sander and 100-grit sandpaper on the rough sides and 150-grit sandpaper on the smooth sides. 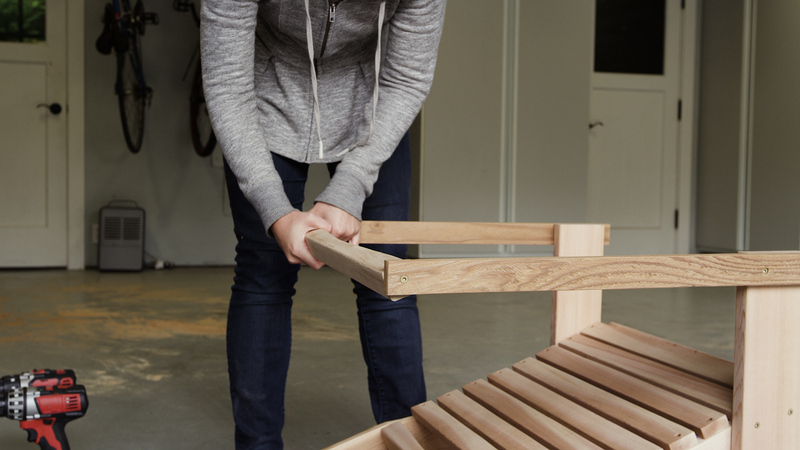 Round out the corners and edges of the lumber to make the chair as comfortable as possible. We'll start assembly with the seat of the chair. First, attach the bottom back support (2" x 2" x 20") to the two diagonal legs you just cut. Measure from the back point of each leg 17 3/4" and mark it with a pencil. Position the back support in front of this line following the slope of the back half of the leg. Pre-drill for one 2" screw in the middle of the 2" x 2" and secure. Repeat with the opposite side and leg. Now it's time to attach the 1" x 2" x 21 1/4" slats to the diagonal legs. Measure 1" in front of the 2" x 2" and mark along the top of the legs. Place your first slat in front of this line. Pre-drill and screw down with 2" screws. The remaining ten slats will be placed 3/8" apart from each other. 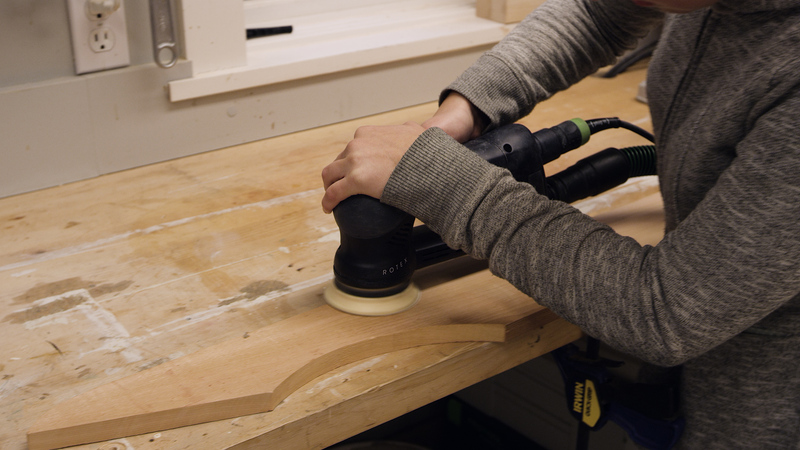 Tip: We cut a thin piece of wood to use as a spacer. We held it against the slat that had just been placed and marked next to it on both legs, then placed the next slat along the pencil line. This works really well when you get to the curve in the front of the chair. 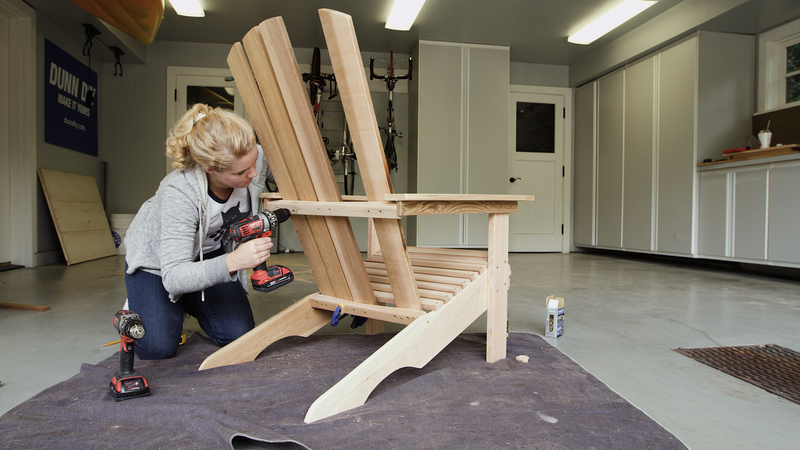 Use scrap lumber or books and magazines to support the seat of the chair until the back legs are flat on the ground. (Make sure to do this on an even surface.) Line up the front 5/4" x 4" legs in front of the sixth slat (counting from the back). Keep the bottom of the legs firmly on the ground. Clamp in place and pre-drill four holes. Attach with four 1 1/2" screws. The 1" x 2" x 23" arm supports will be attached along the outside top of the front legs, overhanging in the front by 1". Clamp in place, pre-drill, and secure with 1 1/2" screws. Attach the middle back support (2" x 2" x 23 1/2") to the ends of the arm supports. Pre-drill and screw in place with 2" screws. This will allow the back support to pivot for the back slats as needed. Position the 2" x 2" about 3/8" below the top of the 1" x 2"s so when it's turned, the corner doesn't rise above the 1" x 2"s.
Now it's time to attach the armrests on top of the supports. These are the angled 1" x 6" x 25" cuts. Measure in from the end of the middle back supports 2 1/2" and mark with a pencil. Line up the armrest with this marking. In the front, measure underneath the armrest on the outside of the 1" x 2" underneath. This measurement should be 1 1/2". The armrest should overhang the 1" x 2" support in the front by 1 3/4". Note: We mixed up one of these measurements and the arms ended up farther apart in the back than they were supposed to be. This made the back slats on our chair fan wider. In this blog we have included the correct measurements to fix that problem. The last piece of the chair that needs assembly is the back. On the bottom back support measure in from the ends 1" and mark with a pencil. Starting with the outside slats, line up the bottom of the board with this pencil mark, and clamp in place. Position the middle of the board snug against the arm rest. Clamp in place against the middle back support. Pre-drill two holes through the slats into each back support. Attach with 1 1/2" screws. Repeat with opposite outside slat. Note: Watch your screw and bit lengths and make sure you don't break through to the front of the chair. Measure and find the center of the back of the chair. Measure out 1 3/4" from either side of this mark. Do this on both the bottom and middle back support pieces, then line up the center slat with these marks. 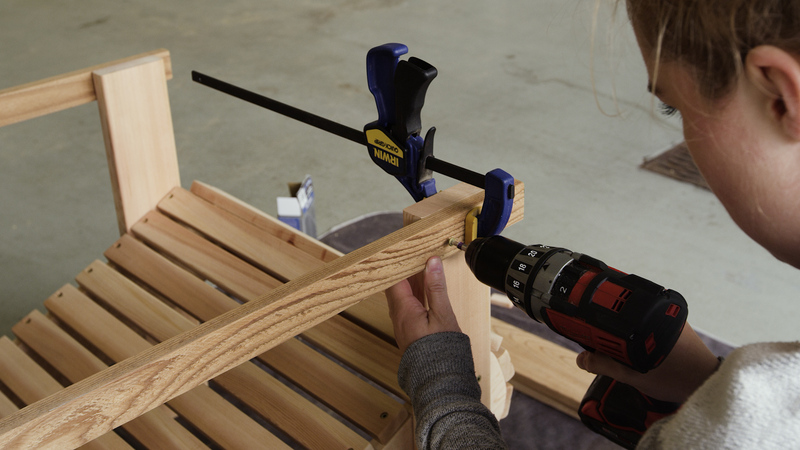 Clamp, pre-drill, and secure with two 1 1/2" screws. Attach outside slats 1" from the either end of the bottom back support and at either end of the middle back support where it meets the armrests. 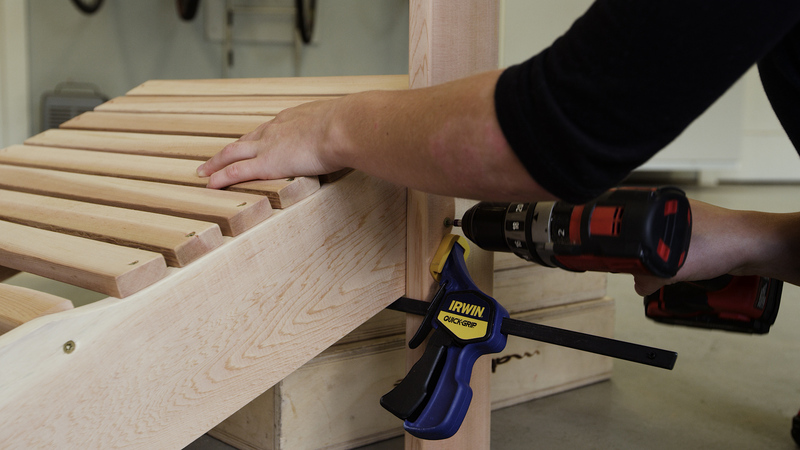 Clamp, pre-drill, and secure with screws. Because the ends of the back supports are wider you'll want longer screws. 1 3/4" screws work well, or you can get away with a 2" screw on the outside and a 1 1/2" screw closer to the center. If you're unsure of a screw length, measure it against both pieces of wood to determine whether it's too long or just right. Attach remaining two slats. Eyeball the position and clamp at bottom. Pre-drill and attach 1 1/2" screws. 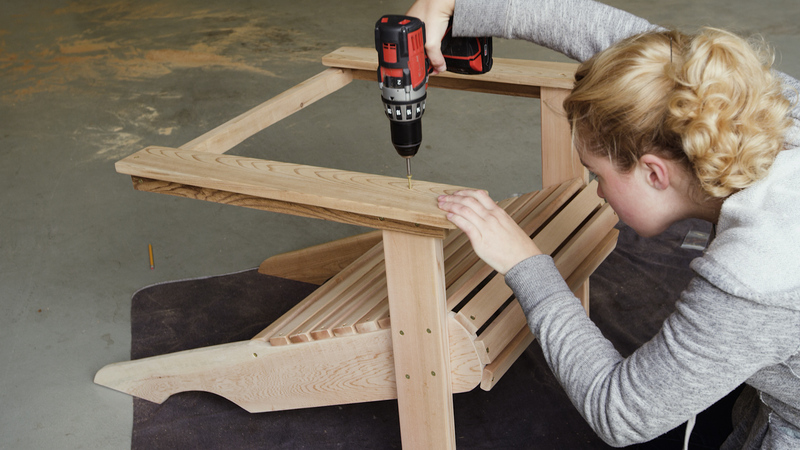 To protect chair and deck surfaces, add floor glides to the bottom of the chair. Hammer in two 3/4" glides to each of the back legs; use two 7/8" glides in each front leg. And now you're done! Sit back, relax, and enjoy!